The Funky Felter: Handmade felted jewelry in my Etsy shop once again! 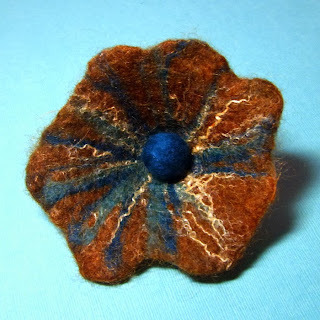 Handmade felted jewelry in my Etsy shop once again! After more than 3 years of being away from Etsy and my blog, I'm finally back and slowly getting things going once again online. Oh, how I've missed it! For all of you who knew my felting blog in the past, I hope for it to be much the same as before with crafts, fiber and felting information, tutorials, tips, reviews, features and some personal tidbits and photos. It will take me a while to get rooted again and back to blogging so I appreciate your patience. I am looking forward to doing it all again though! If you'd like to know what in the world I have been up to for the past few years (witness protection, extended Caribbean vacation, top secret spy mission...hmmm, nope), visit my personal portfolio site and feel free to snoop around a bit. As I said before, I will eventually post about it, just not this particular day. P.s., the felt flower will be listed in my Etsy shop soon. I also hope to do a tutorial on how to make these in the near future. It was created through a combination of needle and wet felting techniques.